Figured I might as well put my link up for the stuff I got on ebay too. If you see anything, I would prefer we deal outside of ebay to avoid the seller fee's. Me too I guess, mostly custom stuff but if anyone wants a bunch of stuff we can certainly negotiate. How many of you got some of those great older figs that were up on Ebay last night? I got some replacement figs for my collection for some that were questionable. kudos to whoever beat me to that dark scar pheyden & agent nemica. Lazzy Lizard wrote: How many of you got some of those great older figs that were up on Ebay last night? I scored a Dominus Callgrim and a Caliber Dome Helios Command Callgrim. The price I paid was amazingly low, so that was pretty awesome. I meant to come in and try to get some of the Callgrim figures, but they ended right at the time I was putting the baby down to bed. Some people got some great deals. Plus, the fact that a fantastic new drop is about to hit could have kept bidders holding onto their money. Yeah you beat me to em, I had my eyes on that phosis sarvos, classified Sarvos & a bunch of others. They are still available in my sales thread on the forum too as long as they don't have a bid on ebay. Christmas + investing in a 3D printer + merciless December Glyos drops kinda left me stretched thin, so I'll be selling my Hades Pheyden MKII. Also throwing in a GITD phase arm (minus Gobon Blaster part) and an extra bonus surprise. Selling my Power Lords. Everything is loose, but everything is there except the gray soldier's gun. Trying to get some drop $$. Listed a few things people might be interested in. If you see anything, I would prefer we deal outside of Ebay to avoid the fee's. Some older translucent Mushis in my collection need to find a new home if anyone's interested, selling under original price. Hard to do but parting with the majority of my jumbo Mordles. Well, only Geihoza sold, so I'm just gonna auction the other three in a lot. So I might have to go on short term disability soon, so in preparation for the 40% cut in pay, I'm parting with some things. One of them being my Zeroids test shot. Also selling a solid metal Noboto head. 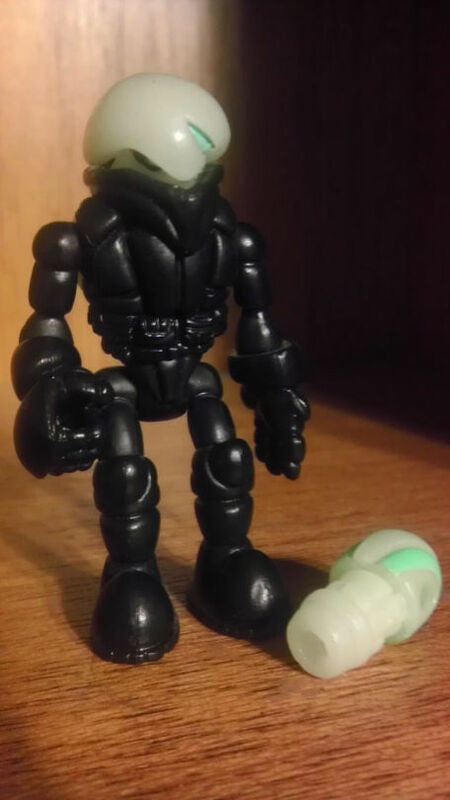 Check the non-Glyos Ebay thread for some other stuff. More stuff for auction soon. Mutt12 wrote: So I might have to go on short term disability soon, so in preparation for the 40% cut in pay, I'm parting with some things. One of them being my Zeroids test shot. Definitely keeping my eye on that Lillith... I need more Darkstalkers/Vampire Saviours stuff in my collection. Also, if you need help with 3d printing let me know, I just popped another spool of ABS onto my printer, so if you need a prototype done give me a yell. Gonna watch some of these new auctions probably. Shamelessly going to plug a few auctions I have going on right now. Still trying to "streamline" my collection and I know there are some newer members for whom these pieces were before their time. Anyway, thanks for your attention. Note: Missing box due to water damage. Also missing alternate Order head due to the seller missing that piece when I originally bought it. Also got some Micronauts stuff in the non-Glyos ebay thread.